COUPON: Use code MSA10 to save 10% off any subscription! The Products: Women or Men’s apparel (in your size), equipment, snacks and supplements, and other fitness items. (Gain[z] Box markets to a CrossFit audience, but I do not think you absolutely have to be into CrossFit to enjoy this box – many of the items are suitable for general fitness enthusiasts!) They promise a $75 value in every box. 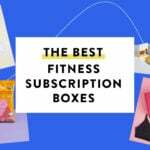 Check out all of our Gainz Box reviews and more fitness boxes in the Fitness Subscription Box Directory! The box came with a full color fold-out information card featuring some of the items from the box in action. I think the posing is often kind of cheesy but I also think it shows people who have a sense of humor and a fun attitude. This month features Crossfit athlete Jason Heighes. I had to use the value from the information card here because there’s no branding on these. I do like getting wrist wraps as they are something I use on occasion, but these are not the most useful wrist wraps I have gotten. (I prefer the style with loops for the thumb and Velcro closures.) These go around my wrists more than 5 times – my wrists are only 5.25 inches in circumference – and I can’t figure out how to tie them up so they are tight and secure. I think they may work better for someone with larger wrists. Fuel Socks – Value $13? These are exclusive to the box and say “Gainz Box” on the bottom, but I couldn’t figure out how to take a picture of the bottom of my own feet. I’ve assigned the value based on other Fuel Socks. These do fit me so I guess they are the “small” size, which covers women’s shoe sizes 5.5-10.5 (I wear a 7). They’re kind of warm for my exercise room at this time of year but I know I will be really happy to have them come winter. I’ve received these before. They do not look like the front of the package when made. (If you want to see a picture, go to my April 2017 BuffBoxx Review.) These are made from oat flour, which doesn’t absorb liquid very well. When I make this package – and I totally will – I am going to add a bit of whole wheat pastry flour (you could also use coconut flour) and some extra chocolate chips. At any rate, glad to have a vegetarian snack this month. This is made from 7 different nuts and seeds and has lots of healthful fats. It is intended as a substitute for something like Nutella. I have learned the hard way that I do not like chocolate sandwiches (no matter how good they sound), but this works for portion control and is pretty good on apple slices or something similar. This must be exclusive to the box because I couldn’t find it in the Workt apparel shop. I like that it is a different style from the tanks that usually come in fitness subscriptions. It’s good to mix things up every now and then. This fits me pretty comfortably and is a nice fabric weight for summer workouts, although my arms are not huge and I don’t know how well it would work if you have big muscles. Verdict: I calculated a value of $78.84 for the August Gainz Box. Even if you think the values for some of the exclusive items are a little high, that is still a great value for a $38 fitness box. (I didn’t add the value of the Halo Top coupon into the total, but you could tack an extra $5.49-$5.99 for that based on the retail prices I’ve seen at local stores.) I was very happy to see all vegetarian snacks this month and will get a lot of use out of the shirt, though the wrist wraps are less useful to me, personally (any advice on getting them to work better for someone with small wrists is appreciated). What did you think of the August Gainz Box? "What is the spoilers for Ipsy plus for May? I would love to know so I know to skip or not. Wasn't all that thril..."
"I agree! That lip oil is awesome! It's not sticky at all! I thought it would be but nope I love it!!"